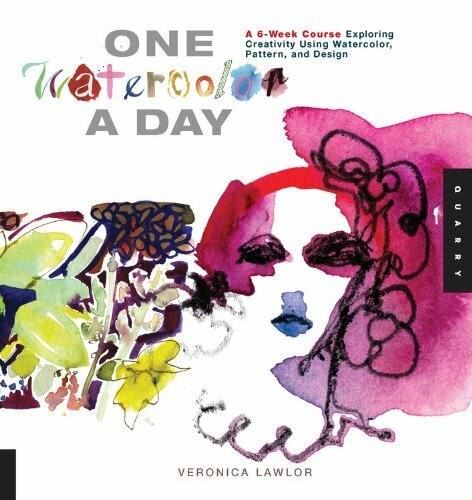 One Watercolor A Day follows the same style as Veronica Lawlor's previous book One Drawing A Day. It's a 6-week course of 42 daily exercises on experimenting with watercolour. The exercises are actually subjects that you can draw such as still life, landscapes, people, places, patterns and other miscellaneous ideas. If you're looking for ideas on things to draw, maybe this is the book for you. This is not a book on watercolour techniques. The visual examples are loose and expressive. Very much like watercolour doodles, not the realistic representational kind, so there's no stress on trying to match the quality that you see. The goal is to have some fun while exploring the styles offered and suggested by the different artists featured in the book. The artists are from Studio 1482, namely Veronica Lawlor, Despina Georgiadis, Eddie Peña, Dominick Santise, Greg Betza, Michele Bedigian and Margaret Hurst. It's a fun book for those who feel like trying something spontaneous, new or different for a change.